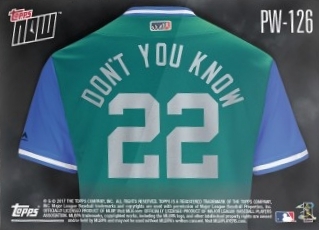 A spin-off of the primary Topps Now Baseball set, 2017 Topps Now MLB Players Weekend not only showcases alternate team uniforms—inspired by youth league unis—but also the player's chosen nickname. All 30 Major League Baseball teams are included, and each team set contains five cards. Celebrating the action taking place from August 25 to 27, every card displays an image from the special weekend on the front. Naturally, card backs feature the reverse side of the player's jersey to show off their unique name. Buy MLB Players Weekend cards on Topps. 2017 Topps Now MLB Players Weekend sets are priced at $19.99 through the Topps Online Store with free shipping via Smartpost. In addition, collectors who purchase a team set get a shot at bonus cards based on the success of the team in question. However, unlike the main '17 Topps Now Baseball, 2017 Topps Now MLB Players Weekend has one "simple" requirement for the team to accomplish. If the team can string together a six-game winning streak anytime from August 22 until the final out of the 2017 regular season, a bonus card is earned. 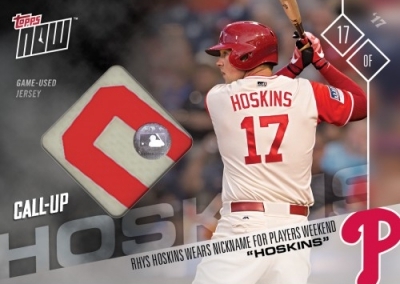 Topps also issued 2017 Topps Now MLB Players Weekend relics featuring game-worn jersey pieces from the nickname weekend. While this is not a new concept for Topps Now, the format saw a shift from prior releases. 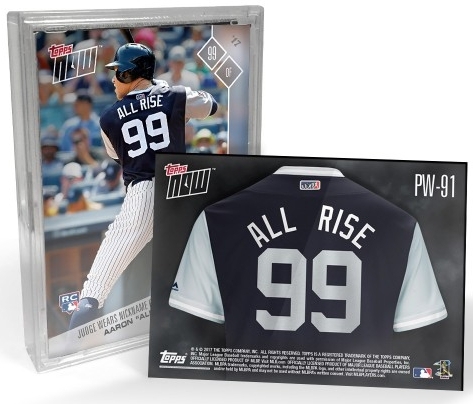 Instead of relic versions that increase in price as the print runs decrease, these offer a chance at base versions or low-numbered parallels (including patches) for the same price. So, while you are certain to get a game-used jersey relic from the player you selected, it could either be an unnumbered card or limited to less than 100 copies. Adding appeal, every card is MLB Authenticated. Prices vary by the player, starting at $50 for Buster Posey and going up to $100 for Ichiro, Rhys Hoskins and Kris Bryant. 150 cards with 5 per team. Buy MLB Players Weekend cards on eBay. Jersey nickname noted for every player. Final print runs are listed for each team. 5 base cards plus 1 bonus card. Final print run is 123 sets. Final print run is 100 sets. Final print run is 254 sets. Final print run is 401 sets. Final print run is 454 sets. Carl's Jr. - Carl Edwards Jr. Final print run is 84 sets. Final print run is 103 sets. Final print run is 294 sets. Final print run is 78 sets. Final print run is 75 sets. Final print run is 122 sets. Final print run is 129 sets. Final print run is 156 sets. Final print run is 345 sets. Final print run is 127 sets. Final print run is 76 sets. Final print run is 96 sets. Final print run is 179 sets. Final print run is 834 sets. Final print run is 64 sets. Final print run is 303 sets. Final print run is 148 sets. Final print run is 52 sets. Final print run is 99 sets. Final print run is 65 sets. Final print run is 113 sets. Final print run is 57 sets. Final print run is 93 sets. Final print run is 125 sets. 6 subjects. Shop on Topps. Purchase of 1 card also gives chance at random parallels. Sales end on September 8 or as supplies last. Versions: Base, Full Color #/99, Blue #/49, Purple Patch #/25, Red Patch #/10, Gold Patch 1/1. 2017 Boston Red Sox Topps Now Players Weekend 5-Card Team Set - Only 401 Sets!